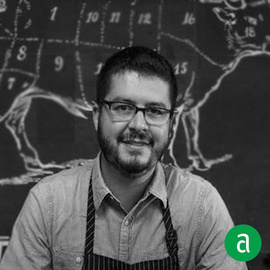 Benjamin Weisberger, Chef de Cuisine and General Manager at The Butcher Shop in Boston, shares his career timeline and words of advice for up-and-coming professionals. Work ethic and attitude are what I look for when hiring. You can teach anyone to cook but you can't teach people to care. I usually find my inspiration in the grocery store and markets. But also from trying out new recipes at home and eating out to see what other chefs are doing. I cannot do my job without Kosher salt and some good olive oil! Cook at home for family and friends; it brings you back to why you cook when work is challenging. Also, don't be afraid to try new foods even if you think you won't like it. This will help develop your palate and you never know, you may end up loving it the flavors! I always tell young professionals to try and work in quality restaurants. It helps you develop basic skills, keeps you organized and focused on the smaller details. I keep my team engaged and motivated by keeping the communication lines very open. We always talk about food and other restaurants that they have recently dined at. I also talk to them about their favorite dishes to cook and to eat.